When friends die, it’s natural for us to praise them and remember all that was good about them, but when the man behind Lumiere Noir died last August, I discovered that he was far more amazing than I suspected. I knew him in two virtual worlds, we exchanged emails, and he was one of the first people to purchase my novel when I published it, but after his death I realized I never really knew him. I wish I had. That’s one problem in virtual worlds. We tend to get to know only one aspect of a person’s life. Swen Wu Kong (left) in There.com with Mignon on May 11, 2003. 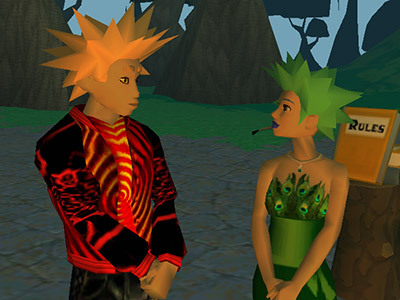 Swen Wu Kong was Lumier Noir in Second Life and Vincent Frost in RL. Today would have been his 52nd birthday. I can’t let it pass without remembering him. In RL he was Vincent Frost, an ESL teacher in Plano, Texas. I knew him as Lumiere Noir in Second Life and as Swen Wu King in the virtual world There.com. This month is the thirteenth anniversary of my meeting Swen Wu Kong in There. 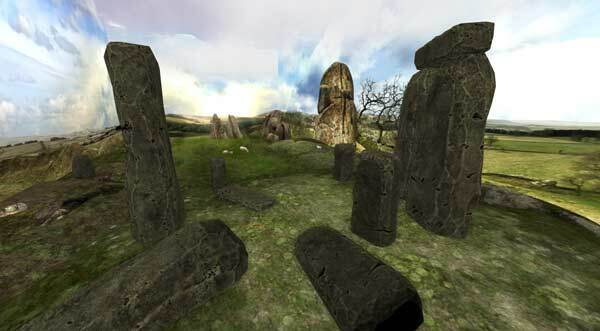 I was new to virtual worlds, but he was an old hand who was transitioning from The Sims through There to Second Life. Exploring There with him was an eye-opening experience to this noob. He also got me started building in There and then in Second Life. Education was his passion. 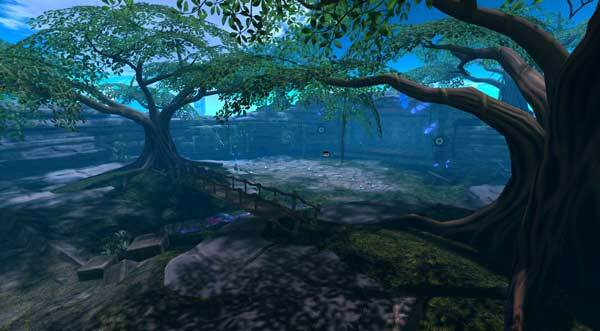 When I finally followed him into Second Life in 2004, I found he had already begun building his Ivory Tower of Primitives and once again, I learned from him what I needed to know to build in this new virtual world. It’s an amazing resource that’s still in existence. SL members can visit it at slurl.com/secondlife/Natoma/247/134/29. You can read Wagner James Au’s tribute to him at http://nwn.blogs.com/nwn/2015/08/ivory-tower-of-prims-second-life-lumiere-noir.html and you can visit his memorial Facebook page at https://www.facebook.com/LumiereNoir.tx?fref=tl_fr_box&pnref=lhc.friends. 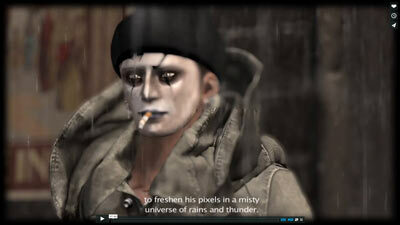 A hundred years from now, when historians want to understand the ways we use Second Life®, how will they know? Computers won’t be anything we even recognize as a computer and won’t run current software or even be able to read installation disks. There are several parts to the problem, and they are true whether we are talking about a virtual world created twenty years ago or if we are talking about Second Life as historians will see it a hundred years from now. The first part of the problem is media. Decades ago, media used for software installation and data storage are obsolete today, such as data cassettes (like the old audio cassettes) and floppy disks. These media are notoriously unreliable and don’t age well. Even if they do hold up over time, it becomes more difficult over time to find the hardware to read them. The second part of the problem is hardware, not just media readers, but the computer itself. Professor Lowood’s presentation included a slide that showed part of this problem: a computer, looking like it measured about three feet wide, three feet deep, and about six feet tall, that was the equivalent of a video card today. Hardware like this from decades ago is scarce to nonexistent, along with the computers that used it, making playing the games that used it impossible. It’s the same problem that historians will have a century from now with Second Life: even if they manage to find a NVIDIA or other video card that will run Second Life well today, they won’t have the computers it goes in. The third part of the problem is software. Even if you have the installation media, the computer, and all the peripherals needed to run the software, how do you run it? What metadata is required for it to run? 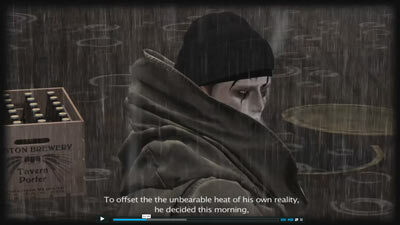 Moreover, it’s not enough to have the software for the game or virtual world. You also need the operating system and any components needed for the game. A fourth part of the problem that may not be obvious at first. It’s cultural: just how did people use the software or game? This is best viewed from the Second Life perspective. A century from now, if historians have the software to run Second Life and they manage to put together a computer for it to run on, what will they see and what will they do? Will the installation software contain all the user-created content that we see today? Will these future historians see a Second Life from 2004 or 2014? 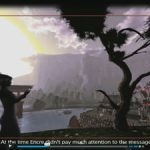 Will they see a 2004 Second Life that even to us looks crude – this writer was in Second Life in 2004 and remembers what it was like – or will it have features that we haven’t yet seen? Even more of an issue will be the fact that future historians will be the only avatars in that world. They won’t know the very many, very different ways we use it, and the very important role it plays in many people’s social lives. For some people, it’s a creative tool, for others it’s a dance hall, for others it’s a workplace, and for others, a vital part of their spiritual lives. There’s no way future historians will be able to experience that for themselves. They will be in a virtual world that’s like a physical world that’s been stripped bare of human life by a neutron bomb, leaving only buildings and prim, sculptie, or mesh vegetation. A fifth problem is one that will only affect researchers, writers, and students: if you’re writing a paper or book and need to include software in a foot note, how do you create a citation for software? For example, if you’re citing a book, you give the page number of the reference, but how do you do the equivalent with software so that others can go into the software and see exactly what you’re referring to? 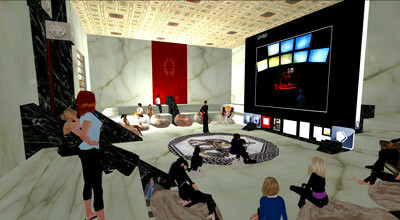 The scope of the overall preserving virtual worlds problem can be seen in a collection housed at Stanford, the Cabrinety Collection, which the university acquired in 1998. It’s only one collection for long-ago games and worlds, but it consists of 15,000 pieces of software that take up over 800 linear feet of physical storage space. Far more software has been created than is in this collection and is of a far greater complexity. Archiving it all will be a gargantuan task. Four U.S. universities are taking part in the preserving virtual worlds and software effort: Stanford University, University of Illinois, University of Maryland, and Rochester Institute of Technology. If you’d like to learn more, you can read Professor Lowood’s blog, HowTheyGotGame.stanford.edu. You can also follow him on Twitter at @Liebenwalde (his avatar name is Liebenwalde Ware). I’ve been publishing articles about Second Life on examiner.com for seven years, since March 2009. 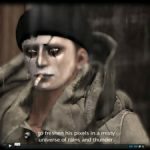 It was a huge archive of events, history, tips and tricks, and photographs of Second Life that I expected to be around for a while, but sadly, it has now vanished. Examiner.com is no more, replaced by axs.com with entirely new content. In the past year or two I wasn’t very active on examiner.com anyway. I was busy for a while building an OpenSimulator grid for a client and more recently ghostwriting for other clients. 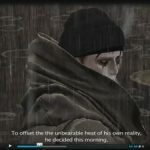 There were some frustrating aspects to writing for exminaer.com, such as the length of articles, some arbitrary formatting issues, and the fact that I could write only about Second Life. 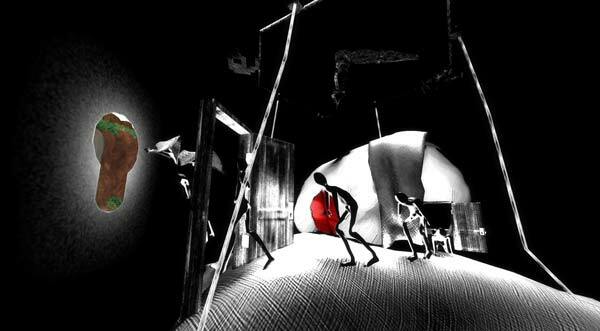 I love Second Life, but I also love OpenSimulator, and I want to be able to explore other developments in virtual worlds. With examiner gone, I’ll be able to do that here. I’m looking forward to it. Stay tuned! Here are my first shots from SL12B. There are some great builds – the following photos are only four of them. In recent years my focus has been more on OpenSim than Second Life, but I’m looking forward to next week’s SL12B Community Celebration. It opens on Sunday June 21, 2015, and runs through Sunday June 28. You can see photos of SL12B on flickr. 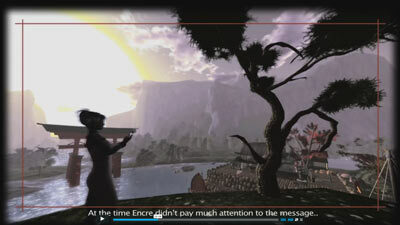 I spent the last year working mostly alone in an OpenSim virtual world I was building for a client. With that behind me, returning to SL and taking part in SL12B will be almost like returning from a isolated mountain cabin to the bustling life of New York City or Paris. I’m looking forward to it and will be reporting from SL12B with lots of photos. I started this blog six years ago, in February 2009, but in recent years I’ve let it languish and for the last year I’ve written no posts at all until today. I’ve had the avatarplanet.com website even longer, since about 2005, but although it once had a decent following, I’ve let it wither and have made no updates for the last three years. It’s time for me to revive both. A total revamping of the website will be coming soon. It’s been over a year since my last post. In that time, I built a 32 region OpenSim grid for a client, doing everything from creating the terrain in L3DT, building and obtaining content, and administering the server, including writing the PHP and Powershell scripts that ran the grid. Sadly, just when it was ready to open for beta. my client shut it down, so no one will ever see what I put so much effort into over the last year. In retrospect I can see a number of things I could have done differently that might have avoided it, but maybe the most important is this: my client never visited the world I was building for his company! Despite my urging, he never had any interest in seeing it. The next time I build a virtual world for a client, there are a number of things I’ll do differently, but at the top of the list will be making sure that my client sees what I’m building and has an interest in seeing it to completion. It’s extremely disappointing to put over a year into building a world only to see it vanish before it even opens to the public. I was paid for my time and gained good experience, so it wasn’t a wasted effort for me, but it is painful.